We today posting another Idea offer to get free internet Data. Previously we posted Idea trick to Get 1.5GB Free 4G Internet Data For All india Users . 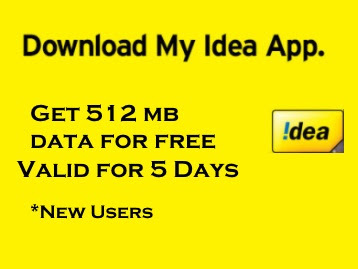 Now Again Idea networks give their Users to Get 512MB Data Free on First Time Registration. Offer is valid for Idea Prepaid users only. How to Get 512MB Data? • Open & Register on My Idea app using your Idea Mobile number. • You will get the 512MB Internet Data within 48 hours of Registration which is valid for 5 Days. 9) The Offer period starts 14th August 2017 and ends 31st August 2017.